Late spring brought challenges for wool growers, as the market softened across the board and fine, medium and strong wools all underwent reductions in demand and therefore in price. Demand fell away largely due to the international situation, specifically the rising tension between China and the United States over trade tariffs. Chinese manufacturers are wary of the consequences of this stand-off, and are not committing to purchasing or processing wool at the same level as they traditionally do, and to the levels they returned to earlier this year. 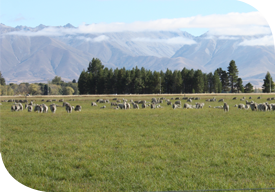 As the Chinese market accounts for between 50 and 60 per cent of New Zealand’s wool clip, Chinese purchasers reducing demand had an immediate detrimental impact for our wool. Uncertainty around trade has also impacted the United States dollar, in turn strengthening New Zealand’s currency, and therefore creating another setback for grower returns. As the fine wool season approaches completion, the recent impact of China aside, market conditions for growers of fine wool were relatively favourable. Demand for Merino wool for use in active sportswear and outdoor clothing continues to grow, while drought in Australia reduced that country’s national wool clip, and therefore overall global market supply of fine wool. For crossbreed wool, reduced demand from China is having a significant impact, and prices now mirror the low levels they dropped to 12 months ago. Despite this, wool growers should continue to prepare their clip to the highest standards. While we have a challenging market at present, growers who consign poorly prepared wool will suffer at auction. Their wool will be discounted more heavily than wool that has been properly prepared and presented for optimum advantage. This report was prepared in consultation with PGG Wrightson’s Wool team.